Little research has been done on the chestnut in California. Thus, we know little about its specific adaptability or productive capacity. Chestnuts are monoecious (separate female and male flowers are borne on one plant—like walnuts) and some cultivars are self-unfruitful; thus, two different varieties should be grown for cross-pollination to produce consistent crops. Trees reach a height of 80 ft. and spread to 60 ft. under ideal conditions. 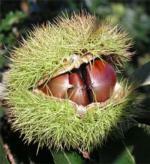 Chestnuts are excellent fruitful, shade trees if grown in very well drained soil. Chestnuts are almost pest free in California. Seedling is the only known rootstock. Edible chestnuts should not be confused with the poisonous Horse Chestnut (Aesculus californica). Fresh chestnuts contain about 50% moisture. Unlike other nuts, chestnuts have low oil content (8%).